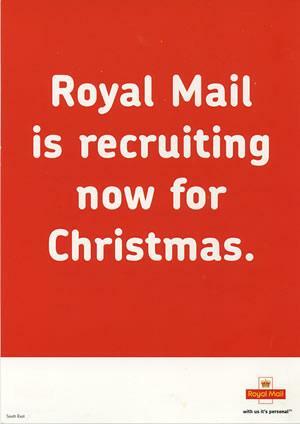 Christmas Jobs with Royal Mail Have Been Posted. In the run-up to Christmas companies across many sectors in the UK face a huge rise in their typical work load. Royal Mail is certainly no exception, having over double the amount of work to contend with over Christmas. To ensure they have the correct measures in place to meet this high demand, Royal Mail are taking on 18,000 extra staff for various positions and shifts all over the UK for the duration of the festive period. Royal Mail requires individuals who are reliable, punctual and able to meet deadlines. It is also important to be fit, as many positions with Royal Mail require heavy lifting and standing for long periods of time. Not only will a job at Royal Mail help you to gain extra pennies, it will also help you to burn off all those extra calories from the typical festive feasts.